The morning after Holly and Stan ran the New Orleans Marathon we started walking down Toulouse toward Decatur (again). We wanted breakfast and figured Monday's lines at Cafe Du Monde would be shorter than a weekend's line. This was true, but our group wanted more of a real breakfast vs just fried dough. After huddling up around Yelp! and adding a pedicab driver into our mix, we determined breakfast would be had a block away at Stanley. We didn't know this until now but many publications rave about their breakfasts. We all agreed it would be a great way to start the day. We walked-off the huge breakfast by heading over to The French Market. This is an open-air pavilion that houses a food court of-sorts (think South Street Seaport or The Reading Market) and a flea market. You can pick up Cajun food items, hand-crafts, t-shirts, CDs, sunglasses, and other assorted junk. Dave was kept at-bay from buying the Pakistani stone cups (looked great for Tequila). Once we finished touring the market we figured we could finally tour Lafitte's properly. Let's face it, this was really an excuse to get a beer before noon. We took Rue Royal over before crossing up to Bourbon. We took our time to take-in the decent weather and classic French Quarter architecture. 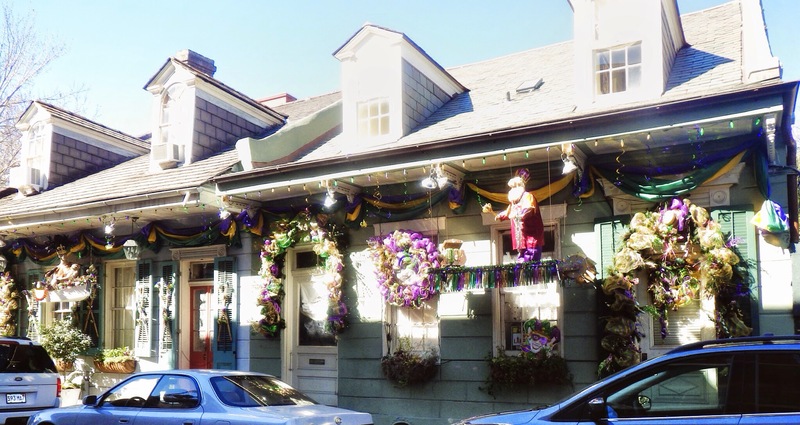 Many of the residents were gearing up for Mardi Gras by decorating in similar fashion as one would do for Christmas. 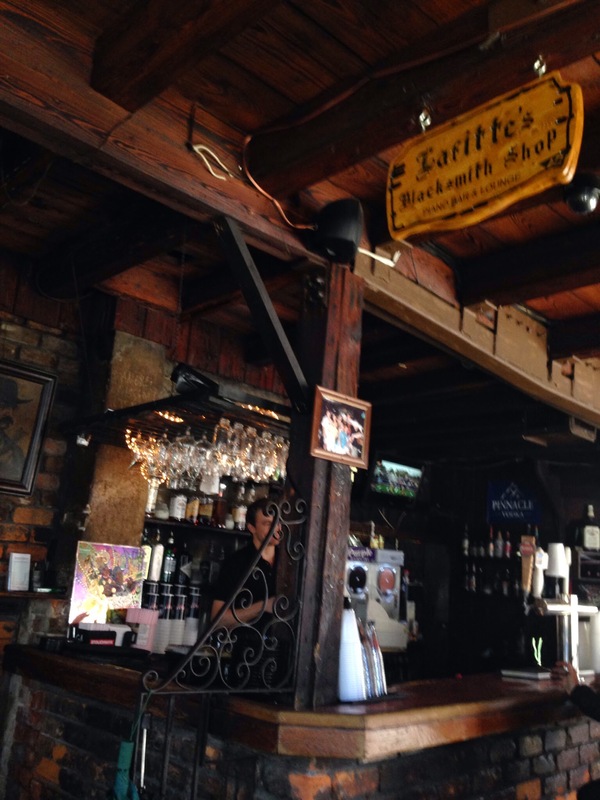 Lafitte's Blacksmith Shop is dank. 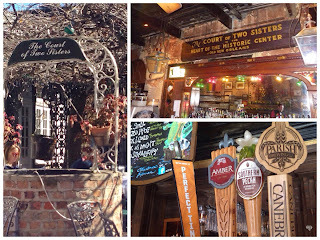 It was built in 1722 and is believed to be the oldest building hosting a bar in America. At 11:30 in the morning it was bright enough to be able to take in the history and the decor of the building. After finishing our drinks (again, we forgot about to-go options) we went down a block to continue our tour of Rue Royal. After a few blocks we headed back down to Decatur and into Cafe Du Monde for coffees and beignets. 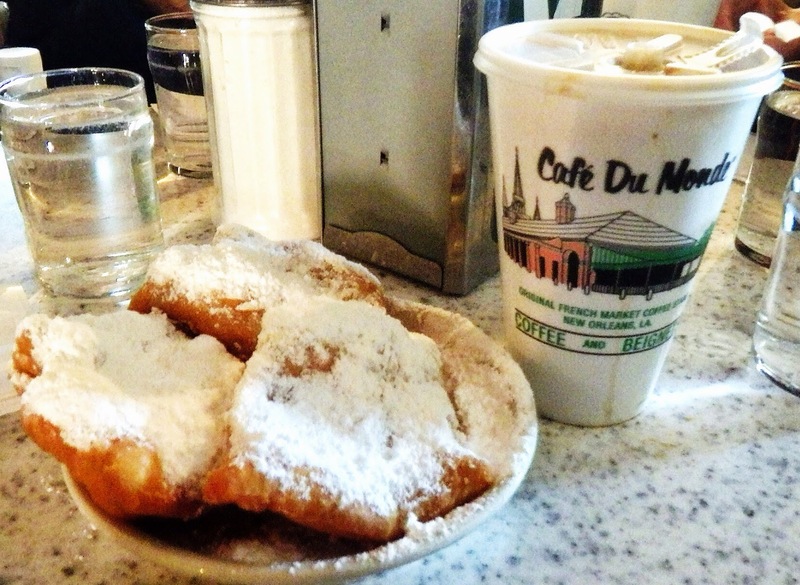 These were hands-down better than Cafe Beignet. 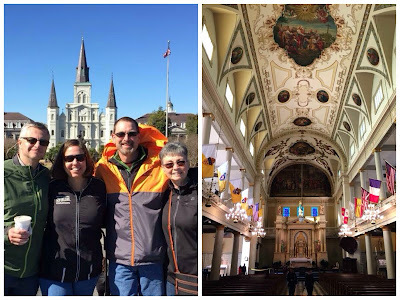 After the snack we toured the Jackson Square area and St. Louis Cathedral before continuing our Rue Royal trek. We stepped into a couple of galleries and souvenir shops along the way. One of the cooler locations we stopped in was Cohen Antiques: home of antique maps, currency, and weapons. A lot of history in that store. Time to eat again. We headed to our 2pm reservation at Nola, an Emeril LaGasse restaurant in The Quarter. Holly and Dave ate here 17 years ago and came away with great memories. Today it is still just as good. 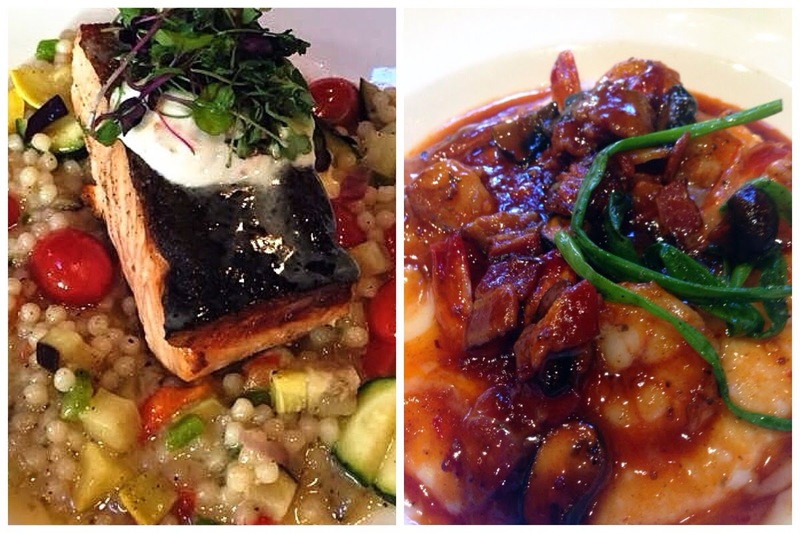 Three of us had the BBQ Shrimp and grits and the other salmon. That is bacon with the shrimp.....it's getting a big picture. A familiar activity this trip was walking off our meal. We headed down to Decatur to see what that part of the street looked like. As we got closer to downtown the feel of The Quarter was shifting to a city feel. 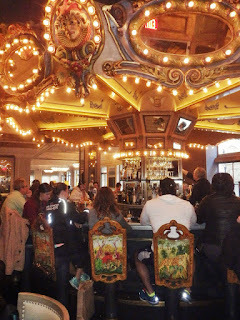 We turned up one of the streets so we could see the Carousel Bar in the Hotel Monteleone. The intention was to have a drink at the revolving bar, but all the seats were full. We admired from afar and left the building (after using their very nice restrooms) to wrap up the Rue Royal tour. One of our final stops was Bevolo: makers of fine hand-crafted brass lamps. We got to tour the showroom and talk with the craftsmen. The conversation centered around food. It had been at least an hour since we consumed anything so it was time to grab a beer. We walked down Toulouse and headed towards Crescent City Brewhouse. In the timeline of the craft beer movement CCB was on the scene very early. They had the formula of an early brewpub: Nice food and a few beers made in-house. Nothing experimental or on-trend. They may have had the same offerings when we were last there 17 years ago. We headed over to Pat O'Brien's for a final few rounds of hurricanes. The weather wasn't horrid so we spent our time in the patio section (but still under heat lamps). Since we hadn't eaten for at least 180 minutes (except for free bags of popcorn at Pat's) we formulated a dinner plan. Not too far away was The Gumbo Shop. We were entertained by Jerome, a very pleasant waiter, and treated to an excellent meal of varying gumbos and BBQ shrimp. After the meal we were served a killer bread pudding. We walked back to the hotel and spent a final few moments together in the hotel bar. Stan and Pam were leaving very early in the morning while we had an early evening flight out the next day. After parting ways Holly and Dave crossed the street to Tropical Isle for some live music. At first we started listening to the rock band, but then moved to the next room for the Cajun band. It really was nice to be in The Quarter where music was ever-present between the bars and high-caliber street performers. We spent the next morning lazily packing, watching TV, and having some bench time in Jackson Square. We had a short walk to our brunch location: The Court of Two Sisters. Brunch is a buffet served in the courtyard while a jazz trio plays. Very pleasant location but the food needed a little help. The buffet area where you got your food was dated beyond being quaint. The actual inside of the building had layers of throwback all over the place. We had some time to kill before we had to leave town so we stopped in for a final sampling of southern beers at Chartes House. This was a place that we would always pass on the way to another location and we'd say something like "that looks like a cool little place for a beer". All the windows slid open to give it an open-air feel and with temperatures near 70 that day it was a perfect way to say goodbye to New Orleans.